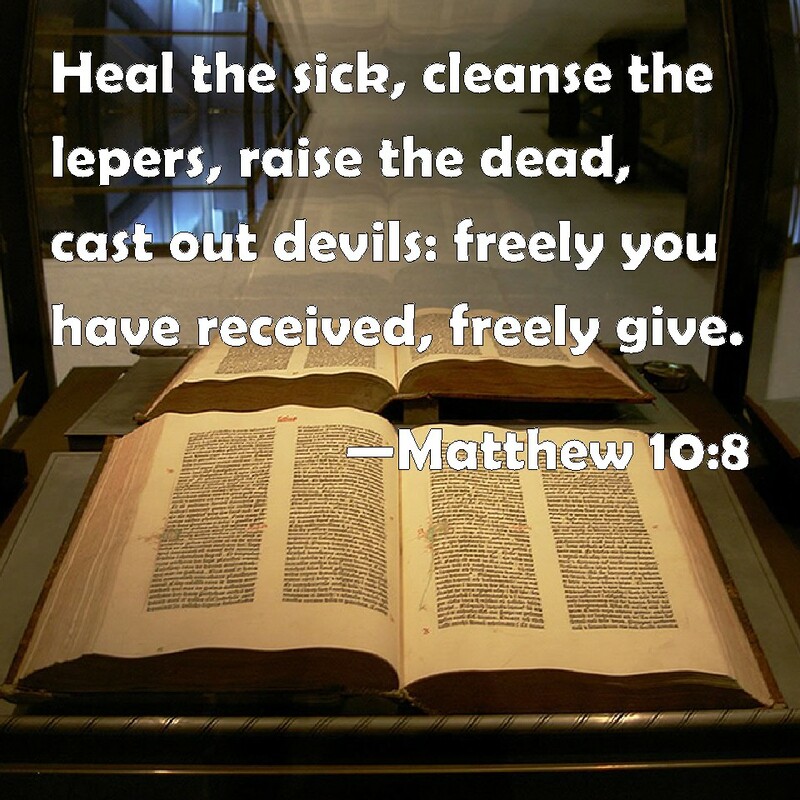 Jesus healed the sick. He commanded the disciples to heal the sick, and to teach future disciples (us) to do the same. How did Jesus heal the sick? Touch / spoken command 8:1-3 When Jesus came down from the mountainside, large crowds followed him. A man with leprosy came and knelt before him and said, “Lord, if you are willing, you can make me clean.” Jesus reached out his hand and touched the man. “I am willing,” he said. “Be clean!” Immediately he was cleansed of his leprosy. Spoken command 8:13 Then Jesus said to the centurion, “Go! Let it be done just as you believed it would.” And his servant was healed at that moment. Touch 8:14-15 When Jesus came into Peter’s house, he saw Peter’s mother-in-law lying in bed with a fever. He touched her hand and the fever left her, and she got up and began to wait on him. Spoken word 9:6-7 “But I want you to know that the Son of Man has authority on earth to forgive sins.” So he said to the paralyzed man, “Get up, take your mat and go home.” Then the man got up and went home. Faith 9:20-22 Just then a woman who had been subject to bleeding for twelve years came up behind him and touched the edge of his cloak. 21 She said to herself, “If I only touch his cloak, I will be healed.” Jesus turned and saw her. “Take heart, daughter,” he said, “your faith has healed you.” And the woman was healed at that moment. Touch 9:25 After the crowd had been put outside, he went in and took the (dead) girl by the hand, and she got up. Touch / faith 9:29 Then he touched their (two blind men) eyes and said, “According to your faith let it be done to you”; and their sight was restored. Spoken Command 12:13 Then he said to the man (with a shriveled hand), “Stretch out your hand.” So he stretched it out and it was completely restored, just as sound as the other. Touch of his clothes 14:35-36 And when the men of that place recognized Jesus, they sent word to all the surrounding country. People brought all their sick to him and begged him to let the sick just touch the edge of his cloak, and all who touched it were healed. Touch 20:34 Jesus had compassion on them (two blind men) and touched their eyes. Immediately they received their sight and followed him. Touch 1:30-31 Simon’s mother-in-law was in bed with a fever, and they immediately told Jesus about her. So he went to her, took her hand and helped her up. The fever left her and she began to wait on them. Touch / spoken command 1:41-42 He reached out his hand and touched the man. “I am willing,” he said. “Be clean!” Immediately the leprosy left him and he was cleansed. Spoken command 3:3-5 Jesus said to the man with the shriveled hand, “Stand up in front of everyone.” … “Stretch out your hand.” He stretched it out, and his hand was completely restored. Touch / spoken command 5:41-42 He took her (the dead girl) by the hand and said to her, “Talitha koum!” (which means Little girl, I say to you, get up!). Immediately the girl stood up and began to walk around (she was twelve years old). At this they were completely astonished. Touch of his clothes 6:56 And wherever he went—into villages, towns or countryside—they placed the sick in the marketplaces. They begged him to let them touch even the edge of his cloak, and all who touched it were healed. Touch / spit / spoken command 7:33-35 After he took him aside, away from the crowd, Jesus put his fingers into the man’s ears. Then he spit and touched the man’s tongue. He looked up to heaven and with a deep sigh said to him, “Ephphatha!” (which means “Be opened!”). At this, the man’s ears were opened, his tongue was loosened and he began to speak plainly. Touch / spit / spoken command 8:23-25 He took the blind man by the hand and led him outside the village. When he had spit on the man’s eyes and put his hands on him, Jesus asked, “Do you see anything?” He looked up and said, “I see people; they look like trees walking around.” Once more Jesus put his hands on the man’s eyes. Then his eyes were opened, his sight was restored, and he saw everything clearly. Faith / spoken command 10:51-52 “What do you want me to do for you?” Jesus asked him. The blind man (Bartimaeus) said, “Rabbi, I want to see.” “Go,” said Jesus, “your faith has healed you.” Immediately he received his sight and followed Jesus along the road. Touch / spoken command 13:10-13 On a Sabbath Jesus was teaching in one of the synagogues, and a woman was there who had been crippled by a spirit for eighteen years. She was bent over and could not straighten up at all. When Jesus saw her, he called her forward and said to her, “Woman, you are set free from your infirmity.” Then he put his hands on her, and immediately she straightened up and praised God. Spoken command 17:12-14 As he was going into a village, ten men who had leprosy met him. They stood at a distance and called out in a loud voice, “Jesus, Master, have pity on us!” When he saw them, he said, “Go, show yourselves to the priests.” And as they went, they were cleansed. Spoken word 4:46-53 There was a certain royal official whose son lay sick at Capernaum. When this man heard that Jesus had arrived in Galilee from Judea, he went to him and begged him to come and heal his son, who was close to death. “Unless you people see signs and wonders,” Jesus told him, “you will never believe.” The royal official said, “Sir, come down before my child dies.” “Go,” Jesus replied, “your son will live.” The man took Jesus at his word and departed. While he was still on the way, his servants met him with the news that his boy was living. When he inquired as to the time when his son got better, they said to him, “Yesterday, at one in the afternoon, the fever left him.” Then the father realized that this was the exact time at which Jesus had said to him, “Your son will live.” So he and his whole household believed. Spoken command 5:5-9 One who was there had been an invalid for thirty-eight years. When Jesus saw him lying there and learned that he had been in this condition for a long time, he asked him, “Do you want to get well?” “Sir,” the invalid replied, “I have no one to help me into the pool when the water is stirred. While I am trying to get in, someone else goes down ahead of me.” Then Jesus said to him, “Get up! Pick up your mat and walk.” At once the man was cured; he picked up his mat and walked. Touch / saliva / spoken command 9:6-7 After saying this, he spit on the ground, made some mud with the saliva, and put it on the man’s eyes. “Go,” he told him, “wash in the Pool of Siloam” (this word means “Sent”). So the man (who was born blind) went and washed, and came home seeing. How did the disciples / apostles heal the sick? Touch / spoken command Acts 3:6-8 Then Peter said, “Silver or gold I do not have, but what I do have I give you. In the name of Jesus Christ of Nazareth, walk.” Taking him by the right hand, he helped him up, and instantly the man’s feet and ankles became strong. He jumped to his feet and began to walk. Then he went with them into the temple courts, walking and jumping, and praising God. Spoken command 9:33-34 There (in Lydda) he found a man named Aeneas, who was paralyzed and had been bedridden for eight years. “Aeneas,” Peter said to him, “Jesus Christ heals you. Get up and roll up your mat.” Immediately Aeneas got up. Spoken command 9:40 Peter sent them all out of the room; then he got down on his knees and prayed. Turning toward the dead woman, he said, “Tabitha, get up.” She opened her eyes, and seeing Peter she sat up. Spoken command 14:8-10 In Lystra there sat a man who was lame. He had been that way from birth and had never walked. He listened to Paul as he was speaking. Paul looked directly at him, saw that he had faith to be healed and called out, “Stand up on your feet!” At that, the man jumped up and began to walk. Touch of his clothes 19:11-12 God did extraordinary miracles through Paul, so that even handkerchiefs and aprons that had touched him were taken to the sick, and their illnesses were cured and the evil spirits left them. Touch 28:8 His (Publius) father was sick in bed, suffering from fever and dysentery. Paul went in to see him and, after prayer, placed his hands on him and healed him. The original disciples did the same sort of things Jesus did, in the same way. Some they told to do something they could not physically do – but they did it. The command Jesus gave those disciples is still in force to today’s disciples. The same Holy Spirit that indwelled them indwelled disciples today, leading them, informing them, instructing them, and empowering them to do the same things, in the same way. This entry was posted in faith, Gospel of John, Gospel of Luke, Gospel of Mark, Gospel of Matthew, Healing, Holy Spirit, Uncategorized and tagged faith, healing, Jesus, Paul, Peter, the 72 by Bette Cox. Bookmark the permalink. AMEN! Regarding your observation, “What did [the apostles] not do? They didn’t pray. They didn’t ask God to do something he had told them to do,” HALLELUJAH!! The Lord truly wants His beloved children to walk in His provision and KNOW this! May I share a link to an article I wrote about it? A great word! Thanks for sharing!